The barred cuckoo-dove (Macropygia unchall) belongs to the family of doves and pigeons, Columbidae. 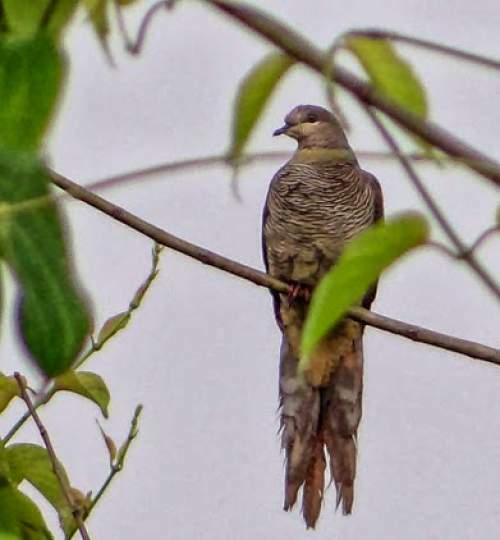 The barred cuckoo-dove species are distributed in India, Nepal, Bhutan, Bangladesh, China, Myanmar, Thailand, Cambodia, Laos, Vietnam, Malaysia and Indonesia. These cuckoo-dove species are long tailed and have brownish plumage. These doves are polytypic species. The barred cuckoo-dove (Macropygia unchall) is a medium-sized dove, measuring 35 to 40 cm in length and weighing 150 to 180 grams. 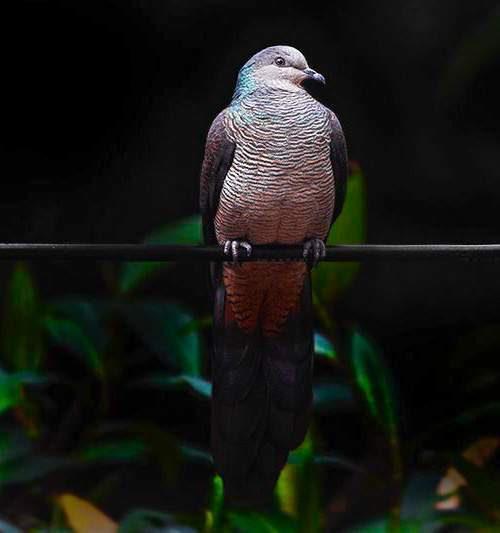 The upperparts, wings and tail of the barred cuckoo-dove are dark pinkish brown. The forehead and throat are pale buff. The hinderneck has green or purplish pink iridescence. The crown, ear coverts and nape are pinkish gray. The underparts are pale buff with fine dark barring. The tail is long and barred. The bill is grayish black and the eyes are dark brown. The feet are pinkish gray. The barred cuckoo-doves make a repeated hooting sound. The barred cuckoo-dove species are distributed in India, Nepal, Bhutan, Bangladesh, China, Myanmar, Thailand, Cambodia, Laos, Vietnam, Malaysia and Indonesia. In India, these doves are distributed in the states of Sikkim, West Bengal, Assam, Meghalaya, Arunachal Pradesh, Nagaland, Manipur, Tripura and Mizoram. In China, these species are distributed in the provinces of Yunnan, Sichuan, Guizhou, Hubei, Hunan, Guangxi, Hainan, Guangdong, Jiangxi, Fujian and Zhejiang. The barred cuckoo-dove nominate subspecies M. u. unchall is distributed in montane areas of Malaysia and Indonesia (Sumatra and Java). The subspecies M. u. minor is distributed in southeast China (Fujian, Guangdong, Hainan), Vietnam, Laos, Cambodia and Thailand. The subspecies M. u. tusalia is distributed in northeast India, Nepal, Bhutan, Bangladesh, Myanmar and China (Sichuan and Yunnan). These barred cuckoo-dove species have moderate forest dependence. These species normally occur in altitudes from 450 to 3000 meters. The artificial ecosystems of these species include trees around agricultural fields, plantations and rural gardens. The natural ecosystems of these barred cuckoo-dove species include montane forests, boreal forests, moist lowland forests, tropical and subtropical dense evergreen forests and secondary forests. The diet of the barred cuckoo-dove consists mainly of seeds. A variety of seeds, cereals, grains, buds, shoots, berries and small fruits are their primary food. These doves are mostly arboreal and occasionally they feed on the ground. The breeding season of these barred cuckoo-dove is from March to July in India and Nepal. The nesting season is from December to March in Malaysia. These barred cuckoo-doves are monogamous. The nests are usually located on the fork of trees. The nest is a flimsy platform made of twigs, sticks and plant matter. The clutch is usually 3-4 eggs. Both the parents incubate the eggs and take care of the nestlings. The nestlings are initially fed with regurgitated crop-milk, a secretion from the lining of the crop of parent birds. Later the nestlings are fed with regurgitated seeds and plant matter. The young fledge in about 15 days and become independent after 35 days. The barred cuckoo-dove species are non-migratory resident birds. The populations in higher elevations may move to lower levels and plains during winter. The global population size of the barred cuckoo-dove (Macropygia unchall) has not been quantified. The overall population trend of these dove species is reported to be stable. Throughout its range this species is reported to be common to rare. The generation length is 5.2 years. Its distribution size is about 12,900,000 sq.km. Habitat degradation and fragmentation, human disturbances at the nesting sites and capture for pet trade are the main threats that may endanger the survival of these dove species. The barred cuckoo-dove (Macropygia unchall) does not approach the thresholds for being Vulnerable, either under the range size criterion, or under the population trend criterion or under the population size criterion. The IUCN (International Union for Conservation of Nature) has categorized and evaluated the dove species and has listed it as of "Least Concern". 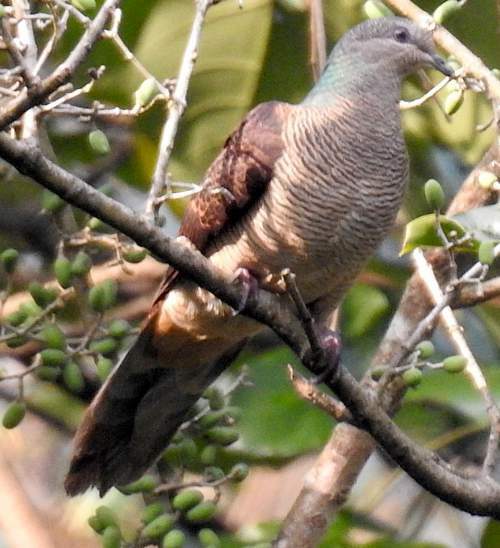 The CITES (Convention on International Trade in Endangered Species of Wild Fauna and Flora) status is ‘Not Evaluated’ for barred cuckoo-dove (Macropygia unchall). The three recognized subspecies of the barred dove (Macropygia unchall) are: Macropygia unchall tusalia (Blyth, 1843), Macropygia unchall minor Swinhoe, 1870 and Macropygia unchall unchall (Wagler, 1827). Current topic in Birds of India: Barred cuckoo-dove - Macropygia unchall.